How many people are familiar with Johnnie Walker? Practically everyone who has had whisky, and even many who haven’t, are familiar with the rainbow of colors that make up Johnnie Walker. Most have heard of Johnnie Walker Red, Black, Blue, and even Green (though Green Label is discontinued) but how many people have heard of The Famous Grouse? Fewer. And how many have heard of its smokier cousin – The Black Grouse? Fewer still. It’s unfortunate because they’re both productions of The Edrington Group – makers of Cutty Sark Blended Scotch Whisky, The Macallan, and Highland Park. I was first introduced to The Black Grouse a few years ago with a public relations company representing The Black Grouse emailed me to find out if I’d heard of them (I hadn’t). They were introducing The Black Grouse in 2007 and offered me up some to try. I’d only vague heard of The Famous Grouse but I was familiar with The Edrington Group and was surprised to learn that The Famous Grouse produces more than 30 million bottles every year and is the 6th best selling Scotch Whisky in the world. Enough trivia, onto the whisky! The Black Grouse is billed as a smokier cousin to The Famous Grouse and their goal was to produce an affordable blended scotch whisky with peatier and smokier characteristics. On that score, they achieved their goal. The nose is smoky yet sweet and it’s unmistakable what they were trying to achieve. Clearly not as smoky on nose or tongue as Ardbeg but you get the point and purpose. Islay addicts will find the smoke in The Black Grouse to be quaint, newbies will find it to be a fine introduction to smokiness. Present but not overpowering. A bit like how you smell after sitting next to a campfire for an hour, rather than all night. On the palate, it was light brown sugar sweet and light in body with a dark chocolate finish. One night, for comparison (and the reason why Ardbeg is referenced above), I had some Ardbeg followed by The Black Grouse. I wanted to compare it to what is considered the peatiest Islay and The Black Grouse, likely by design, was merely an echo of Ardbeg. I wish I had, on hand, some Famous Grouse to make the comparison but unfortunately I didn’t. One crucial point to remember is that The Black Grouse, and its cousin The Famous Grouse, retail for under $30 per 750ml. The Famous Grouse can be found for under $25 per 750ml. That’s a very affordable bottle and puts it at roughly the same price point of a Johnnie Walker Black and Red, for a basis of price comparison. It’s not the smoothest scotch, it’s difficult to expect that at this price point, but it’s smooth enough that you whisky drinkers won’t notice unless you had something aged much longer ahead of it. All in all, they’ve packed a lot of value into this bottle. This entry was posted in Tasting Notes and tagged Ardbeg, Black Grouse by Jim. Bookmark the permalink. The famous Grouse only became famous because Margaret Tatcher offered it at her parties. The Black Grouse has only recently appeared on shelves of supermarts and had to be looked for – hardly to be found in an off-licence. Red and Black Labels are not in the same league in taste or price. The Red one gives me a frightful headache. I now do Glenmorangie – Astar, -Ruban and Nectar d’Or in that order of preference. John how old is black grouse and is it same as black lable.? 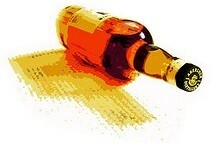 The Famous Grouse is my “everyday” whisky, I really like the taste and I can buy the 1.5 liter for $28.00. The Macallan is what I would drink everyday if I were rich. For the price, it’s really really really tough to beat it. 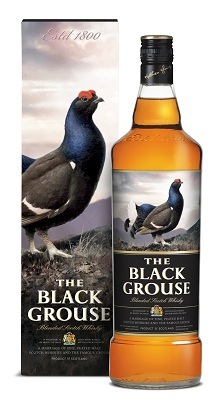 Black Grouse is really good too if you want more smokiness. This is a good review, and you can taste the mix of Macallan and smoky Islay. I’m an Ardbeg fan, my fav, but Black Grouse is about half the price. I prefer it to Johnnie Walker Black, normally, and it pears well with Trader Joe’s single malt Islay that’s under $20. Outstanding buy for the price, brown sugar, little bit of peat, tasty grown man candy.. I live in Indianapolis and had a taste of this a few days ago. Can this scotch be purchased locally or do I have to order it online? I would love to have my own bottle. It’s pretty widely available but you might have to call around to be sure. Unfortunately, some of you folks are comparing apples to oranges when compare Famous Grouse (red or black) to some single malts. They simply play in different leagues, no even mention the difference in price. Blended Scotch before a meal with finger food.